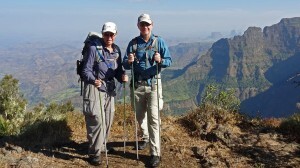 In January of 2012, Darren and Sandy Van Soye set out on a 424 day, around-the-world expedition, visiting 53 countries on six continents. Their goal was to bring geography to life for as many young people as possible in hopes of instilling a greater appreciation and curiosity about the planet, people, and cultures. They also trekked nearly 500 miles in some of the most remote and beautiful places on earth. You can learn more about their journey at trekkingtheplanet.net. Darren and Sandy Van Soye, welcome to The Pursuit Zone.